As British retailers flounder, the groups that rent them floor space have been pointing to continuing robust demand for prime locations. Debenhams’ potential restructuring not only threatens a key source of rental income. It also undermines landlords’ main counterargument. A person walks past a Debenhams store in Stockport, Britain January 4, 2018. British department store chain Debenhams said on Sept. 10 it was reviewing its options, including a possible legal procedure that could see it close more stores. 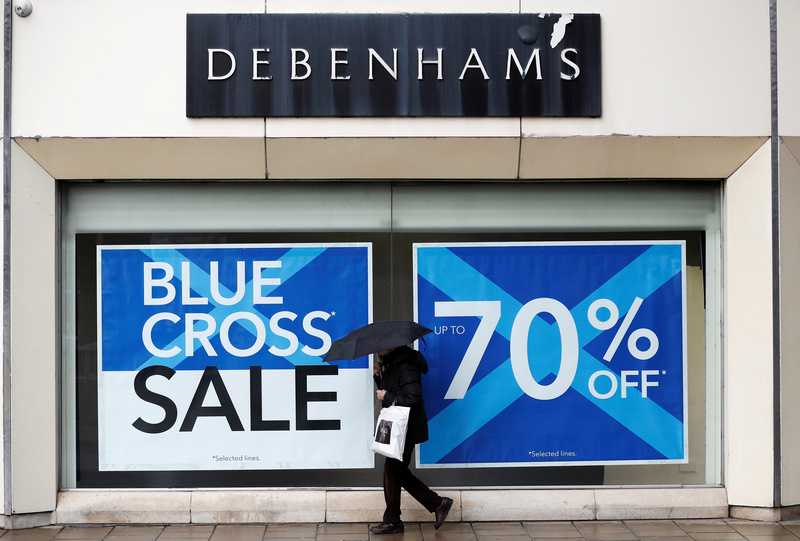 Debenhams, which issued three profit warnings this year, widened the remit of adviser KPMG to include “longer-term options” such as a possible Company Voluntary Arrangement (CVA). CVAs allow retailers to avoid insolvency or administration by offloading unwanted stores and securing reduced rents on others. They have been adopted by British retailers including fashion chain New Look, Carpetright and Mothercare. Debenhams also released a trading statement on Sept. 10 which said its forecast for pre-tax profit for its full 2017-2018 year is within the current range of analysts’ expectations. It said it expected to report a pre-exceptional pre-tax profit of around 33 million pounds, within the current market range of 31 million pounds to 36.5 million pounds, and year-end net debt of about 320 million pounds. Shares in Debenhams plunged 15 percent to 10.4 pence on Sept. 10 after a report from the Sunday Telegraph revealed the retailer was in talks with KPMG regarding a restructuring plan. The shares have since recovered to 11.9 pence by 0804 GMT on Sept. 11.